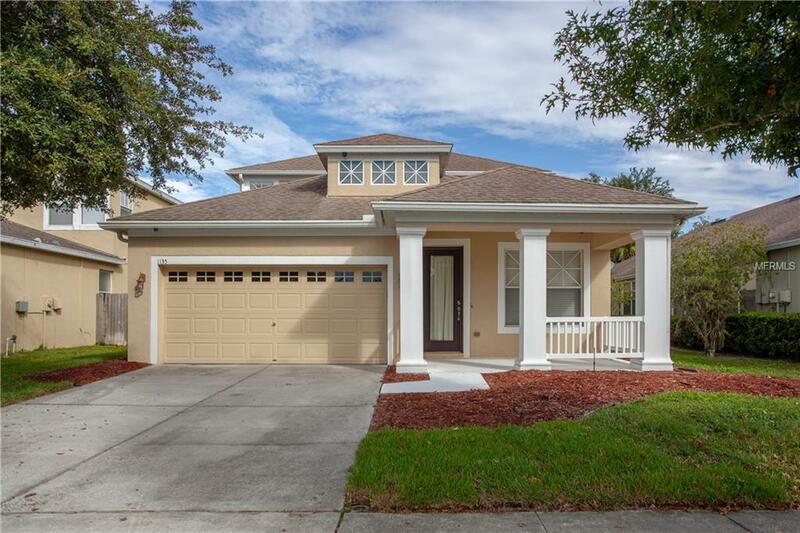 The small gated community of Belle Chase is very convenient to all the growing amenities offered in Wesley Chapel, but tucked quietly away at the same time. It is also the host of this former model home that consists of 3 bedrooms, 2.5 baths, bonus room, 2-car garage and fenced yard. The upgrades in this home include 17 tile laid diagonally throughout the living/dining room, kitchen and family room, 42 wood cabinets, solid surface counters, tile backsplash and stylish decorating features that are the advantage of a model home which include crown molding and a built-in desk and storage in the bonus room. The screened lanai overlooks the fenced backyard. This home is ready for your own landscaping designs and the covered front porch provides the perfect setting to meet and greet your neighbors. In 2018, new stainless-steel kitchen appliances were added which include the range with a single oven that can be converted to a double oven with separate controls, two nest thermostats, and a 65 4K mounted TV in the family room which stays along with the 5 surround sound speakers. Also included is the washer and dryer. Belle Chase is convenient to businesses in Wesley Chapel, New Tampa, Lutz, and Land O Lakes. It is close to I-75, the Tampa Premium Outlet and all the new restaurants, Wiregrass Mall, Center Ice, and Florida Hospital-Wesley Chapel. Easy travel to USF and Pasco-Hernando State College-Wesley Chapel. There is no CDD fee and low quarterly HOA dues. Additional Lease Restrictions Verify Restrictions With First Service Residential Management. Pet Restrictions Verify Restrictions With First Service Residential Management.